My research activity is directed towards the understanding and control of quantum interference phenomena. In particular the propagation of spin excitations using both NMR experiments and theoretical tools. The study of such phenomena as the mesoscopic and the polarization echoes can improve our comprehension and control of decoherence processes and irreversibility. The main topic of my publications is the spin dynamics of open systems interacting with a spin-bath characterizing the internal system dynamics and how it is modified by the environment (decoherence and dissipation). My last work is about the swapping operation, essential for Quantum Information Processing, modified by a spin-bath. 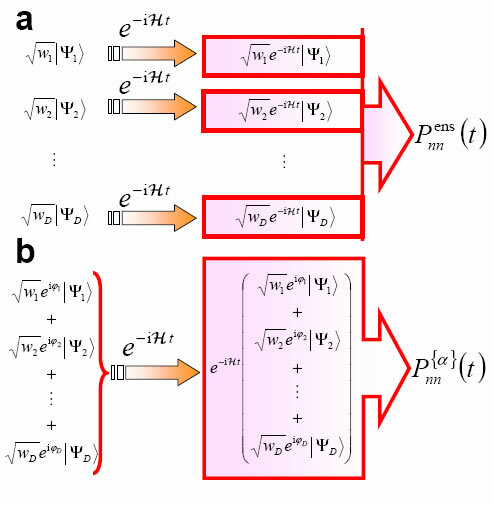 We made a model to describe the swapping dynamics which, depending of the system-environment interaction, show a quantum dynamical phase transition which is manifested in NMR experimental implementations. Recently, I have studied the Loschmidt Echo (fidelity) and the Polarization Echo (local return probability after a temporal reversion) in many-spin systems. 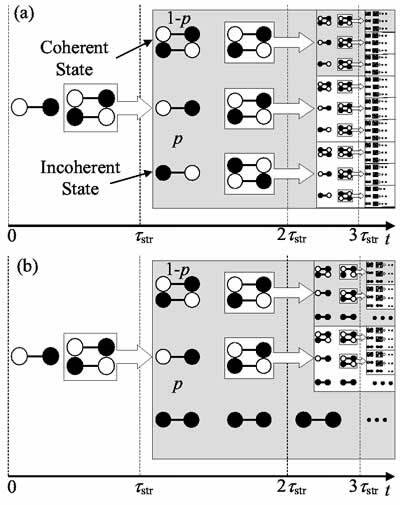 pure input states for a quantum simulator to yield ensemble evolutions. G. A. Álvarez. 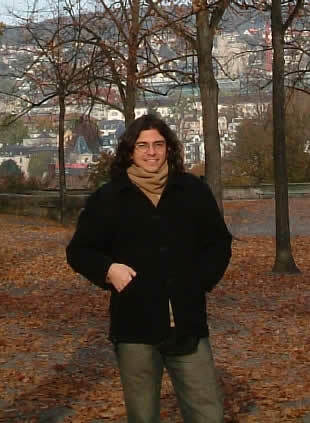 Ph.D thesis, Universidad Nacional de Córdoba, 2007. arXiv:0705.2350 [PDF file]. J. Schliemann, A. V. Khaetskii, and D. Loss, Phys. Rev. B 66, 245303 (2002). B. Paredes, F. Verstraete, and J. I. Cirac, Phys. Rev. Lett. 95, 140501 (2005). S. Popescu, A. J. Short, and A.Winter, Nature Phys. 2, 754 (2006). M. Rigol, V. Dunjko, and M. Olshanii, Nature (London) 452, 854 (2008). Figure. Local spin dynamics in a 14-spin system. Panel (a) shows the extreme of a spin ladder with the ratio between the x and y couplings by/bx = 1/10. Panel (b) shows the local dynamics in a spin star with dipolar interactions given by a normal distribution with zero mean and sigma variance. 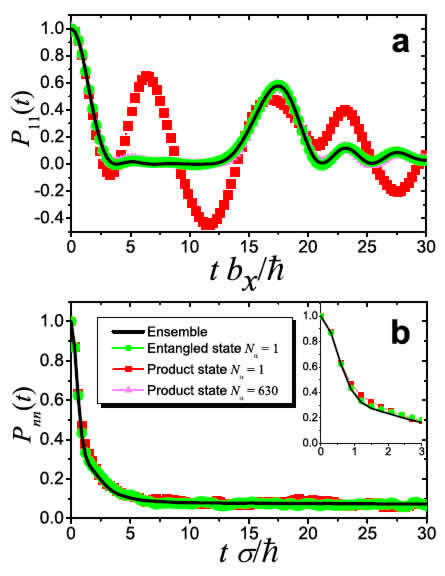 The ensemble dynamics (solid line) is compared with the randomly correlated pure-state evolution. The square (red) and circle (green) scatter points correspond to the evolution obtained with a pure product state and a pure entangled state respectively. In panel a), the triangle scatter points (light magenta) correspond to an averaged evolution of 630 pure product state which is the lower value yielding the ensemble dynamics. For other cases with only one state is enough. Figure. Schemes of the quantum evolution of an ensemble (panel (a)) and a pure-state (panel (b)). Each |phi_i> is a simple tensor product state. 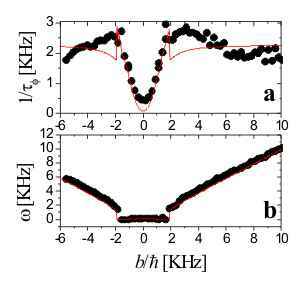 Environmentally induced Quantum Dynamical Phase Transition The manifestation of the quantum Zeno effect through frequently measurements or strong interactions with a quantum system led us to a novel interpretation of previous experiments . In ref. 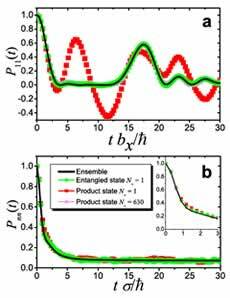 , we found experimental evidence that environmental interactions can drive a swapping gate (two-spin system) through a Quantum Dynamical Phase Transition towards an over-damped or Zeno phase. The NMR spin swapping experiments in a 13C-1H system enable the identification and characterization of this phase transition as a function of the ratio between the internal and system-environment interaction. 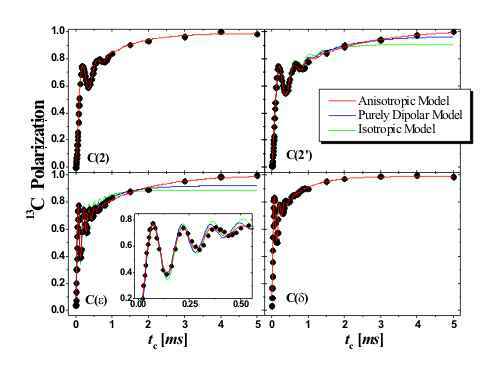 We developed a microscopic model [3,4] for the swapping operation to describe both phases and the critical region with great detail, showing that it depends only on the nature of the interaction [2,4]. In particular, it shows that the phase transition does not occur if the system-environment interaction gives isotropic interaction rates. 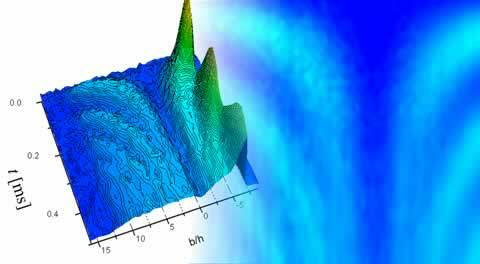 Spin dynamics wihin Keldysh and the standard density matrix formalism I solved the generalized Liouville-von Neumann quantum master equation to obtain the dynamics of many-spin systems interacting with a spin bath [1-3]. I also solve the spin dynamics within the Keldysh formalism [4-6]. Both methods together gave us the possibility to obtain numerous physical predictions that contrast well with Nuclear Magnetic Resonance experiments. A. K. Chattah, G. A. Álvarez, P. R. Levstein, F. M. Cucchietti, H. M. Pastawski, J. Raya and J. Hirschinger. J. Chem. Phys., 119, 7943 (2003). [PDF file]. G. A. Álvarez, P. R. Levstein, and H. M. Pastawski. Physica B 398, 438 (2007). [PDF file]. E. P. Danieli, H. M. Pastawski, and G. A. Álvarez. Chem. Phys. Lett. 402, 88 (2005). [PDF file]. G. A. Álvarez, E. P. Danieli, P. R. Levstein, and H. M. Pastawski. Phys. Rev. A 75, 062116 (2007). [PDF file]. 1H system. Data points are obtained from cross polarization experiments. The zero plateau in the frequency and the parabolic behavior of the decoherence rate are indicative of an over-damped Zeno phase. Solid lines are the prediction of our model. Figure: Quantum dynamical phase diagram for the spin swapping operation. The figure shows the frequency dependence on system-environment (SE) interaction anisotropy pXY and the ratio among the internal and the SE interaction. The projection plane determines the phase diagram where the transition between the swapping phase into the Zeno phase (frequency null) is manifested. Values of pXY for typical SE interaction Hamiltonian are indicated in the contour plot. P. R. Levstein, G. Usaj, and H. M. Pastawski. J. Chem. Phys. 108, 2718 (1998). G. A. Álvarez, E. P. Danieli, P. R. Levstein, and H. M. Pastawski. J. Chem. Phys. 124, 194507 (2006) . [PDF file]. E. P. Danieli, G. A. Álvarez, P. R. Levstein, and H. M. Pastawski. Solid State Comm. 141, 422 (2007). [PDF file]. Molecular characterization through spin dynamics From a practical point of view, spin dynamics observed by NMR has proved very powerful in order to characterize molecular structures and dynamics . Experimental observations together with simple analytical solutions for few-spin dynamics can provide detailed information on the intra and intermolecular interactions [2-4]. 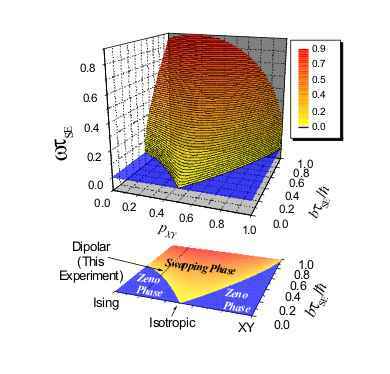 This is particularly important for the characterization of complex fluids in their native state, where one uses cross-polarization (CP) dynamics [5,6] to evaluate order parameters . However, the reliability of these and other structural and dynamical parameters depends on the accuracy of the spin dynamics description to which the experimental data are fitted. We solve the spin dynamics of different real systems [8-11]. The solutions are applied to get more detailed information from our NMR experimental data [8,9]. This leads to new methodologies for molecular characterization. Stroboscopic representation of the system-environment interaction useful for numerical implementations We developed a stroboscopic model [1,2] for the system-environment interaction within the Keldysh formalism through the Generalized Landauer-Büttiker equation (GLBE) . The GLBE leads naturally to a stroboscopic representation of the system-environment processes. 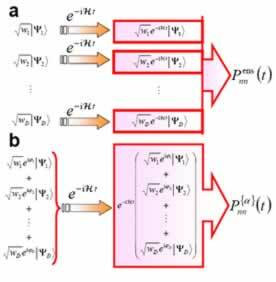 This leads to a very efficient numerical algorithm where the quantum dynamics is obtained in a sequence of time steps. Figure: 13C polarization as a function of contact time tc for aromatic and aliphatic carbons of the crystal liquid 8CB in a standard CP experiment at 300K (smectic phase). Fittings of the experimental data to our models are displayed. Figure: Quantum branching sequence for the swapping dynamics. Panel a) stands for a Coulomb system-environment interaction and b) a pure hopping one. Single states represent states with interrupted evolution (incoherent) while pairs of states are coherent superpositions. Notice the self-similar structure. K. Schmidt-Rohr and H. W. Spiess, Multidimensional solid state NMR and polymers, Academic Press, 1996. L. Müller, A. Kumar, T. Baumann, and R.R. Ernst. Phys. Rev. Lett. 32, 1402 (1974). P.R. Levstein, G. Usaj, and H.M. Pastawski. J. Chem. Phys. 108, 2718 (1998). G. Usaj, H.M. Pastawski, and P.R. Levstein. Mol. Phys. 95, 1229 (1998). S.R. Hartmann and E.L. Hahn. Phys. Rev. 128, 2042 (1962). C.P. Slichter, Principles of magnetic resonance, 2nd ed., Springer-Verlag, 1992. R. Pratima and K.V. Ramanathan. Journ. Magn. Reson. A 118, 7 (1996). A.K. Chattah, G.A. Álvarez, P.R. Levstein, F.M. Cucchietti, H.M. Pastawski, J. Raya and J. Hirschinger. J. Chem. Phys., 119, 7943 (2003). [PDF file]. G.A. Álvarez, E.P. Danieli, P.R. Levstein, and H.M. Pastawski. J. Chem. Phys. 124, 194507 (2006) . [PDF file]. G.A. Álvarez, P.R. Levstein, and H.M. Pastawski. Physica B 398, 438 (2007). [PDF file]. G.A. Álvarez. Ph.D thesis, Universidad Nacional de Córdoba, 2007. arXiv:0705.2350 [PDF file]. G.A. Álvarez, E.P. Danieli, P.R. Levstein, and H.M. Pastawski. Phys. Rev. A 75, 062116 (2007). [PDF file]. H.M. Pastawski. Phys. Rev. B 44, 6329 (1991). ibid. Phys. Rev. B 46, 4053 (1992).